One year I decided to do a million push-ups. I’m not joking. Physically, I knew it was possible. I do push-ups all day long, so why not keep a tally and knock off a million in one year? I created goals for myself. If I walked through a doorway I’d dropped and do twenty. At the top of the hour run off another fifty. Ten every time the phone rang. I figured with my normal amount of push-ups I do throughout the day, by adding a few hundred more I’d get to a million. I mean, we’re talking like a couple thousand per day, right? The essence of martial arts is goal oriented. From the very first moment a person comes to our school, they have a goal: weight loss, physical fitness, self-defense, etc. People don’t wander in off the street thinking Tae Kwon-Do is something they should do. There’s a reason they’re here. There are short and long term goals. You create a series of short term goals in order to achieve your long term goals. 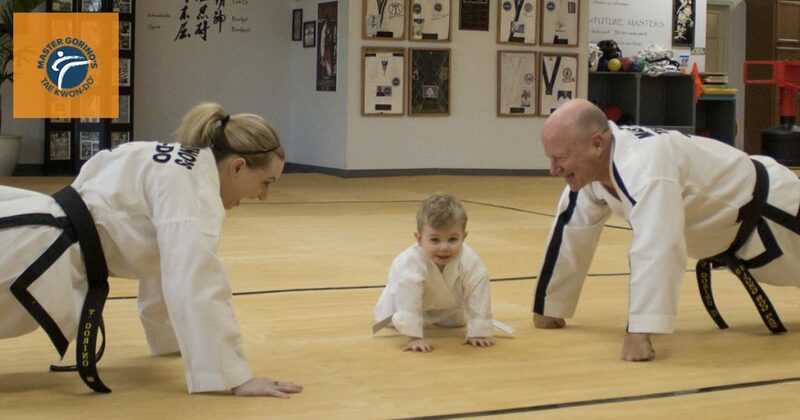 In Tae Kwon-Do, the long term goal is earning your black belt and becoming a master. So we create a series of small goals to get your there. First, you earn your uniform. We teach you two kicks and two punches. Boom, you got your uniform. Then we focus on the white belt. You can achieve your goals by using a system. Know what you want. Don’t just say you want to lose weight, how many pounds do you want to lose. Have a plan. How are you going to get to your goal. It’s good to have a coach to hold you accountable. Take consistent action. A little bit every day. Don’t skip a day without taking some sort of action towards achieving your goal. Even if it’s only 5 seconds doing something, don’t lose focus of that goal. Review & renew your goals. You have to review your goals to make sure you’re on track and the goals are attainable. Having a goal to lose 50 pounds in a month is an unachievable goal and you’re setting yourself up for failure. We make small achievable goals because little things become big things. You stack ‘em. 1,000,000 dived by 365 days equals 2,740 push-ups per day. Divide that by 16 waking hours and you get 172 per hour. That’s 3 push-ups every minute for a year! After I reviewed my goal I realized it was completely unreasonable seeing that I have a life and can’t go off to a deserted island for a year and do push-ups. It was a bad idea. So I renewed my goal to a more manageable number of half a million.